Published: Nov. 9, 2017 at 01:16 p.m. Updated: Nov. 14, 2017 at 12:12 p.m. When NFL scouts are evaluating prospects, they're often asked to categorize each player as a special-teams contributor, valued backup/spot starter, or long-time starter. The best players are labelled as potential Pro Bowl candidates -- those prospects are picked early, and teams will want their potential to be realized quickly. 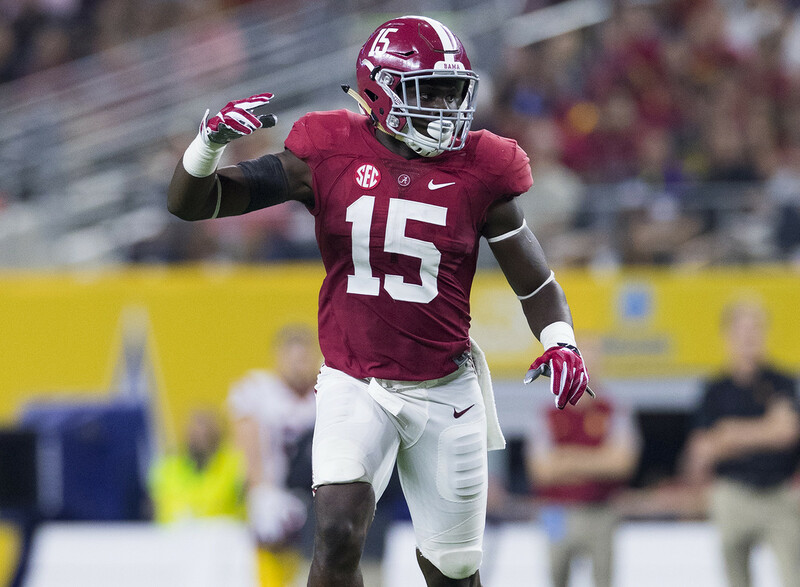 There are plenty of college football players currently displaying the potential to one day be among the NFL's elite players, whether they are part of the 2018, 2019, or 2020 draft classes. Here are 10 college players with the best chance to become a Pro Bowler within their first three NFL seasons. The players are ranked from 1-10, with No. 10 being the least likely Pro Bowler and No. 1 being the most likely Pro Bowler. Note: Voting for the 2018 Pro Bowl opens on Nov. 14. Click here to vote. Harrison is a hard hitter, solid tackler, and more than just capable in coverage. His all-around skill set will make him one of the top safeties in the league within three years. Forget what you might hear about his lack of experience in-line -- if healthy, Andrews will be a matchup nightmare for NFL defenses. He has tight end size and receiver-like agility in the open field. Quarterbacks all over the league will beg their general manager to pick up this dude. Michel likely won't be a first-round pick. However, backs like Jordan Howard, DeMarco Murray, Devonta Freeman, and Le'Veon Bell have shown that backs don't have to go in Round 1 to quickly earn the support of Pro Bowl voters. Michel has the ability to break off big runs and should get more reps as a receiver at the next level. If given the chance to be "the guy", unlike the platoon role he has now in a stacked Bulldogs backfield, I suspect Michel will be very productive. Hurst doesn't have great size (listed 6-foot-2, 280 pounds), but Pro Bowl defensive tackles are not always in the Gerald McCoy/Ndamukong Suh mold. Aaron Donald, Geno Atkins, and Jurrell Casey were considered undersized coming into the league. Hurst's motor, strength, and agility will make him a difference maker up front. Teams need to find defenders who can attack the quarterback. Chubb's that guy. He has brought down the QB in the backfield 18 times in his last 22 games. He's also strong enough to hold the line of scrimmage on early downs, making him a three-down defender worthy of accolades. Ridley only ranks 75th in the nation with 584 receiving yards, and has found the end zone just twice this year. However, NFL scouts will ignore those statistics and see the speed, quickness, strong hands, and outstanding body control that will allow him to be a target on quick, intermediate, and deep passes like Pittsburgh's Antonio Brown. I still don't know why Pittsburgh was able to get Pro Bowl guard David DeCastro with the 24th overall selection in the 2012 draft. Teams won't let that sort of fall happen with Nelson, a dominant lineman who will help make stars of the skill-position players he blocks for on Sundays. It looks like Nick's brother, the Chargers' Joey, is on his way to a Pro Bowl berth in his second NFL season, one year after collecting 10.5 sacks in 12 games as a rookie. Ohio State's rotation up front will prevent the younger Bosa from putting up huge stats in college, but scouts are already seeing a lot of similarities in the games of the two siblings (size, instincts, relentlessness, playing with leverage). I won't be surprised if Nick and Joey are playing with or against each other in a Pro Bowl in a few years. Rookie running backs often get the ball early in their careers, and for the best of the bunch, it can lead to Pro Bowl appearances early in their careers. Barkley is that type of back. His combination of strength and speed should allow him to accumulate large amounts of yardage in Year One. Every team that faces the Cougars knows Oliver is a beast. He not only wins gaps in a hurry, but chases down plays to the sideline even though he weighs more than 300 pounds. He's a special talent, and much will be expected from him early in his NFL career.